Google Project ARA - The Future Of Smartphones? But, When? 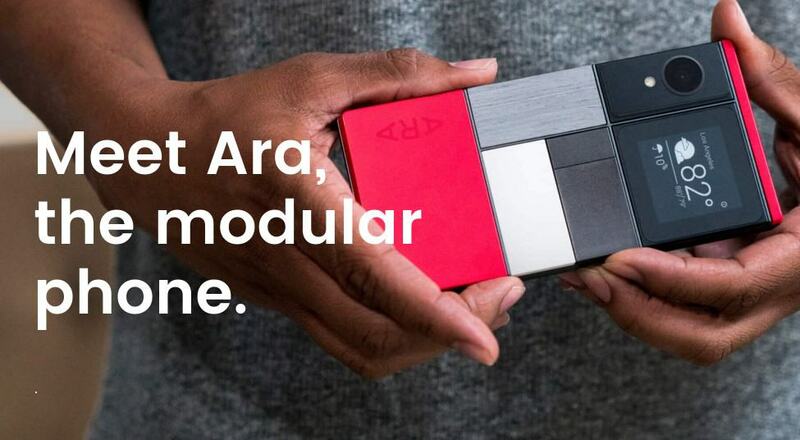 After an excruciatingly long wait, the Advanced Technology And Products division at Google (ATAP) finally announced its modular smartphone project: ARA at Google I/O this year. A lot of folks had been waiting, bated breath, for an announcement from behind those closed doors. Since the Spiral 2 prototype released in January 2015, Ara has come a long way, some would say in an entirely different direction too, but we’ll get back to that. Rafa Camargo, Project Ara’s technical lead at ATAP brought a fully functional prototype of an ARA device on stage during the Google I/O ATAP keynote, thus explaining and giving us a good idea as to what ARA comprises. ARA has now transformed into a full-fledged device on its own with its CPU, GPU, antennae, display, sensors, and battery-all built into the skeleton of the device. It then has six generic module slots on the rear of the device in which modules can be attached in any configuration. The platform used throughout the modular development is the UniPro or Unified Protocol networking technology. The protocol allows for transfer speeds of up to 11.6 gigabits per second, between the modules and the skeleton, while using less than 1/3rd the power that USB 3 uses. UniPro allows the modules to be interconnected between other UniPro devices as well so the smartphone does not remain isolated as a device, but rather can be integrally interconnected with other UniPro devices. This would mean that even high bandwidth applications like hi-resolution video cameras or real-time data recording will be supported for modules simultaneously, all controlled by and from the ARA smartphone. Google Project ARA – The Future Smartphone? But How/Why? The design of the modules is going to be a standard that will be maintained, to ensure that future modules will be compatible with present ARA devices and that present modules will be compatible with future devices, thus future-proofing the platform too. This standard includes electromagnetic latches to fasten the modules onto the device and connectors which are designed for over ten thousand connection cycles, making all the modules robust and sturdy. Modules can be made of multiple materials including, but not limited to various kinds of wood, glass, concrete, etc. Currently, there are modules for hi-res cameras, hi-fidelity speakers, e-ink displays, a flip stand, expansion battery packs, wood, concrete, etc. and there’s even a glucometer in the works, to check one’s blood glucose levels on the go. These are all just a few of the various kinds of modules that can be built and made available. The applications of various modules are close to endless. The Greybus ARA software stack allows what could be the most important of all the features for modules – direct plug and play functionality. There’s no waiting period required between plugging in a module and getting to use it, and no drivers to be installed. This combined with ARAs software based module management will allow a user to pick and choose which module to install or release on the go. As was demonstrated at Google I/O, one can select the module to be released, and when the device is placed flat on its face, the module just pops off, ensuring that you don’t drop the module while holding it. You could, on the other hand just say something like “OK Google. Eject the Camera.” and when the device is placed face down, the module will be released. The developer’s edition of Project ARA was announced to become available in Q4 of 2016, and the consumer edition is slated for a 2017 launch. This could mean that ARA is moving out from under the umbrella of ATAP and probably going to move directly under the umbrella of Alphabet Inc., under which Google itself, also exists. Those of you who have followed ARA and its original concept-Phonebloks, since its inception, may notice that the direction that it’s presently moving in has changed. It is no longer a completely modular device that can become the last smartphone you’ll ever need to buy with swappable CPUs and GPUs, but rather a semi-modular standalone device that allows for a range of accessories that can be integrated into the device. This may be a good thing and a bad thing. On the brighter side, this would mean that we will have a larger number of third-party modules in a vast variety of applications developed for the consumer market, very soon. With the developer edition to be released in fall this year, developers and companies who previously did not have an opportunity to make products that reach the consumer market will have the chance to do so. This will also change the way users customise their devices too. On the darker side, though, the idea behind phonebloks, originally was to try to reduce e-waste by not having to discard a device when it became obsolete but rather, only having to upgrade the part that is obsolete or broken. The current model will be far more similar to our present day smartphones where one would need to change the entire device if any of the core components in the skeleton become damaged or obsolete. Project ARA seems to have a very highly aspiring goal in that the team wants to have other ARA devices in the future, including ARA personal computers, ARA IoT devices, etc.The ARA smartphone is just the beginning of a whole new revolution of interconnected modular devices. A space enthusiast and DIY fanatic, he lives and breathes technology and the sciences, whether electronics, consumer gadgets, exploration etc. He is constantly on the lookout for avenues to creatively add value to the workplace and his career at Fingent, an enterprise software development company, headquartered in New York.